Allsec Technologies Company Career Jobs Opening 2018-2019 Various Team Leaders Posts Download Application at www.allsectech.com Allsec Technologies Career Job has Recently Announced 2018 regarding Team Leaders & Various Job Openings Interested and Eligible Candidates can Download Application Through Official website. 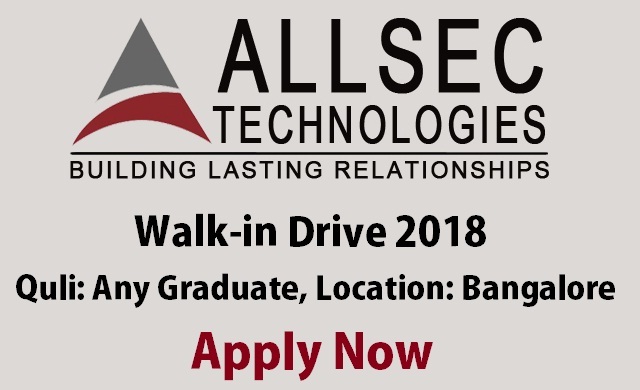 Allsec Technologies Walk-in || Team Leaders @ Any Graduate - Apply Now. Liable for team attrition, performance and escalations. Generation of first level of reports (Associate level reports). Maintain and incorporate the values of the organization through self and team members. Should have worked as a team leader for at least 1year for an outbound campaign (Apart from telecom). Residency cross road, Bangalore - 560025."